Home › First Ladies › First Ladies Live Longer: Top-Secret White House Fountain of Youth? Five of the Ten Longest-Living First Ladies gathered in 1991 for the Reagan Library dedication: Lady Bird Johnson, Nancy Reagan, Barbara Bush, Rosalynn Carter and Betty Ford. Pat Nixon, also in the picture, died at the relatively young age of 81. A quarter of a century has passed since Nancy Reagan was First Lady of the United States. Last week, she achieved another notable benchmark. Born in the working-class neighborhood of Flushing, Queens on July 5, 1921 to eventually live in the White House, Mrs. Reagan reached the age of 93. In three months time, she will surpass the exact age that Betty Ford lived until but Nancy Reagan was already among the longest-living of First Ladies. Among the top Longest-Living First Ladies, Edith Wilson startles Bess Truman in Washington, political figure Lindy Boggs standing between them. And whether it is a reflection of strong genes (dying at 99 years old, Mrs. Reagan’s mother was the longest-living among the mothers of First Ladies), finding a general well of public support in times of personal crisis, unsurpassed medical care or just a general trend of American women living longer, it is remarkable to see the dramatic rise in longevity among this infinitesimal demographic in the last half century. Among the Ten Longest-Living First Ladies, six have served in the White House since 1945, the demarcation point of the post-World War II era when advanced medical technology began to boom. Former First Lady Barbara Bush shoots hoops. Lady Bird Johnson and daughter Lynda Robb welcomed to the White House by First Lady Laura Bush in 2005, the former First Lady’s last visit there, two years before her death. If there is some top-secret water fountain of youth hidden in the White House, this peculiar longevity record bodes well for another one of those postwar First Ladies. Although she has yet to announce whether she’s decided to run for President in the 2016 election, her critics claim that former First Lady (and U.S. Senator and U.S. Secretary of State) Hillary Clinton’s age will be a factor working against her. Were she to run and win the presidency in the 2016 November election, Hillary Clinton would celebrate her 69th birthday on October 27th a week earlier. Contrary to some press reports it would not make her the oldest person elected President. That record is held by Ronald Reagan who was also 69 years old when he was elected President in November of 1980, but who celebrated his 70th birthday in February of 1981, less than a month after being inaugurated. Born in 1947, Hillary Clinton’s becoming First Lady in 1993 marked the ascendance of a a new generation; she and her two successors, Laura Bush and Michelle Obama, were all born since 1945 and were already in young adulthood when a more focused national effort was made towards understanding and improving women’s health. As First Lady she led efforts on behalf of a variety of women’s health issues, successfully lobbying to increase medical research funds on women’s heart health and extending federal coverage of early breast cancer detection. Out of her generation: Hillary Clinton at center with Nancy Reagan, Lady Bird Johnson, Rosalynn Carter, Betty Ford and Barbara Bush – five of the longest-living First Ladies all of the previous generation. The group of First Ladies just previous to them were all born within the seventeen year range from 1912 to to 1929, but coming into their senior years in the flush of medical breakthroughs beginning in the Clinton Administration years in 1993. So, is there something to this idea that the water drunk at 1600 Pennsylvania Avenue has a magic chemical akin to human growth hormone in it? In 1947, along with Presidents Truman and Hoover, former First Ladies Frances Cleveland (second from left) and Edith Wilson (far right) joined Bess Truman. Dying at 83 in 1947, Cleveland was bumped from the top ten longest-living list as more recent ones have lived longer. Certainly the food served to families there is of the highest quality, but not likely the water. In fact, there was speculation in 1989 that the water system might have been somehow tainted when President George Bush, and First Lady Barbara Bush both developed the autoimmune hyperthyroid ailment Graves Disease. It may well be that, despite having to endure the losses and tragedies which come to all people, these women have been generally given the chance to lead fulfilling lives with the privilege of also helping others who do not. Here is an article on the National First Ladies’ Library Blog I wrote last year about the subject with more detail on the statistics and photographs of the longest-living First Ladies. A year after leaving the White House, former First Lady Bess Truman enjoyed tending to the flowers of her garden, back home in Independence, Missouri. At 97, she is the longest-living First Lady. In 1982 Lady Bird Johnson joined Betty Ford for a final push towards the Equal Rights Amendment. at the Lincoln Memorial. They are the second and third longest-living First Ladies. Aged 93 and 89, respectively, Nancy Reagan and Barbara Bush at the 2007 funeral of former President Gerald Ford; they are the fourth and fifth longest-living First Ladies. Escorted by Washington Post drama critic Richard Coe, former First Lady Edith Wilson attends the 1961 Kennedy Inaugural Concert. She died eleven months later at age 89, making her the sixth longest-living First Lady. Living to age 88, Anna Harrison, wife of one president and grandmother to another, was the seventh longest-living presidential spouse, depicted here in a posthumous portrait by artist Lyle Tayson. Seated on the front porch of her Nashville, Tennessee home, former First Lady Sarah Polk lived until 1891 just a month shy of her 88th birthday, making her the eight longest-living First Lady. Edith Roosevelt, delivering a radio speech to Republican women in 1932, lived to age 87, making her the ninth longest-living First Lady. Former First Lady Rosalynn Carter and her husband in the Yellow Oval with President Barack Obama during a reception before a state dinner for China’s president on January 19, 2011. Next month, Mrs. Carter will be 87 years old, making her currently the tenth longest-living First Lady – and rapidly rising in rank. 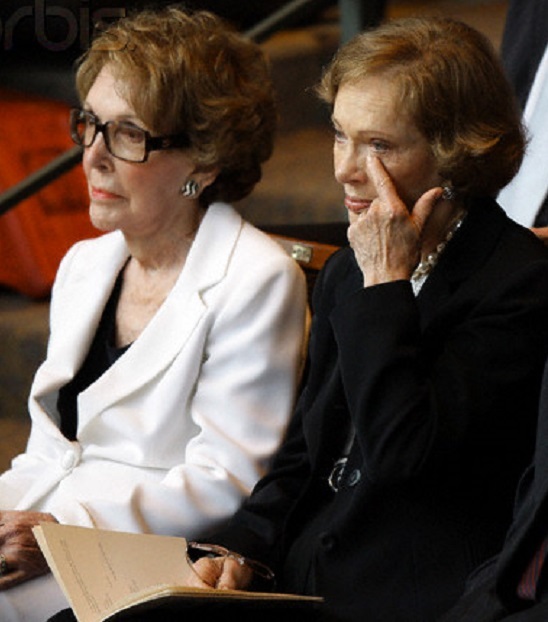 Once considered political adversaries when their husbands ran against each other for President in 1980, former First Ladies Nancy Reagan and Rosalynn Carter mourn together the passing from their “sorority” of Lady Bird Johnson at her July 2007 funeral service. I think that it might go the other way: a man can’t make it to the presidency without the support and aid of a fantastically strong lady! And thanks for the picture of Sally Polk! Great lady; deserves to be better known. Any idea how our former First Ladies are doing mentally – are they all still “sharp”? Do they all keep up with political events, etc.? On a separate note, funny to see Mrs. Reagan and Carter sitting together – I always thought there was no “love loss” between them – I certainly do not remember Mrs. Reagan every saying anything nice about Mrs. Carter. I think once they’ve had the experience of living there, all President and First Ladies draw closer in understanding each other. Thank you very much. That’s an interesting topic – will look into it. Appreciate your subscribing. Interesting article! I always enjoy your writing about the First Ladies. And sadly, the First Lady most often mistaken for being the youngest, died far to young. Jacqueline Kennedy died at just age 64. Interesting piece Carl. As always. I just noticed that in the 1991 photo at the top that all of the First Ladies that were alive at the time were present except for Jackie Kennedy. Do you know why she was absent? Joseph – thank you for this. I actually had 87 years old in that nugget paragraph with all their ages, but need to correct the second reference to it and will do it now. Thank you for catching it – you are the numbers man! Carl, great article. One correction to your caption of the Edith Wilson photo at the 1961 Inaugural Concert. Richard Coe was, I believe, the drama critic of The Washington Post, not the music critic. Mark – thanks, will make correction. I have sometimes thought that some widowed first ladies live so long because their entire adult lives have been exercises in adapting themselves externally to the demanding needs of their career-oriented husbands, while at the same time maintaining a rock hard sense of personal self upon which they stand unshakable when at last left on their own. Seen from another angle, super-achieving men often seem to have nothing left to live for once their work lives cease, while their wives, who have spent decades externally supporting them but internally cultivating rich and resilient lives of their own, could well end up with more than enough internal resources to give them reasons to go on into a vibrant post-political and post-marital future. That’s a superior analysis which I think may well be a primary factor in this phenomena. Yet extreme stress experienced by those like Jackie Kennedy and Pat Nixon (coping with assassination and resignation) may well have taken a big toll on them. And birth women smoked heavily to reduce stress. There’s also the role of humor in survival, whether one lives long or not. I’ve often thought Jackie Kennedy was one of the great comediennes of her age, for example. As when she supposedly broke some of the gloom of her final illness by exclaiming: ‘And to think I wasted all that time doing all those push-ups!’ Has anyone ever written a book on presidential or first lady humor? You are right about that. Even when Mrs. Onassis lost her hair during her chemo treatment and took to wearing a turban, she joked to friends in the hospital that maybe now people still interested in her would finally stop wearing the dated old pillbox and start wearing turbans. Rose Kennedy (Mother of JFK) is the longest living parents of either Presidents or First Ladies dying at 104.